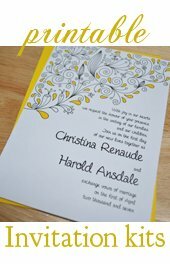 Our printable wedding invitation templates are the ultimate solution to creating affordable homemade wedding invitations. Customize the wording and text for your invitations using our free templates, print them onto heavy cardstock, and set your creative side free! The printable templates are provided to you completely and absolutely blank of any graphics or artwork. We want you to use these with any of our wonderful crafty tutorials here on the site. Or let your craftinista side take over and create a personal and one-of-a-kind invitation with your own artwork or craft supplies. 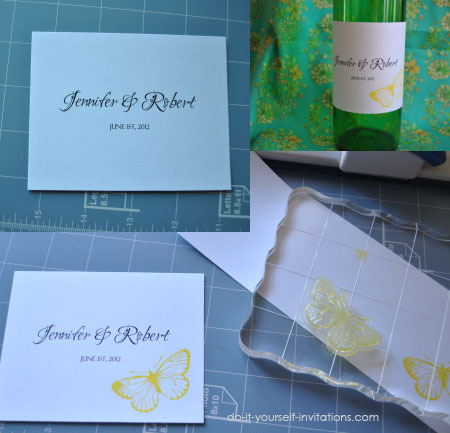 You can embellish your invites using rubber stamps, stickers, pressed flowers, and more. You can mount them onto cardstock or a pocket folder, or decorate and use them "as is". The sky is the limit! Everything you need to create a full wedding stationery and invitation suite is included here. You'll find not only these cool printables to create wedding invitations, but also save the date cards, response cards, place cards, favor tags, table numbers, and more. And the best news? You cannot break your budget using our templates because they are completely free! You Can Create Elegant Stationery With Our Wedding Invitation Templates! You can create an invitation suite that is beautiful and will not put a huge dent in your wedding budget! Don't believe me? Scroll down and check out some of the pieces I put together using these very wedding invitation templates. With some smart thinking, perfect planning, and some of the suggestions above you can create a fantastic wedding stationery set with little cost and big on impressions! I hope you have fun with them! And as always, we would love to see your fab creations! All of the following templates can be customized by text only. Unfortunately there is no way to upload or attach clip art of any kind. These are more of a hands on wedding crafts project. The great news is that you can make very beautiful and cost effective invitations with these, just by adding a little bit of creativity. The most cost effective DIY wedding invitation, I recommend using a rubber stamp along with this template. You can buy a nice rubber stamp and some ink for under $20. Combine that with a store sale or some coupons and you could really be in for some hefty savings! To use the templates you will need to have Adobe Reader installed on your computer. If you do not have the program pre-installed it is absolutely free to download from Adobe.com. Once you have downloaded the template, simply open the file, highlight the text you wish to change and start typing. Press "Control" and "E" at the same time to bring up a text tool palette. You can change the fonts, font style, color, size, alignment, and more. To start from scratch highlight the entire text and delete it. Place the cursor in the middle of the page and start typing! The templates only work with the fonts that are installed on your computer, so you may want to upload or buy some more fonts to work with. You can get free fonts to work with by visiting Dafont.com and 1001freefonts.com. You can also purchase fonts from Myfonts.com. After customizing the text and wording print the template onto some heavy white cardstock. I like to use 110 Lb. standard white 8 1/2" by 11" cardstock. 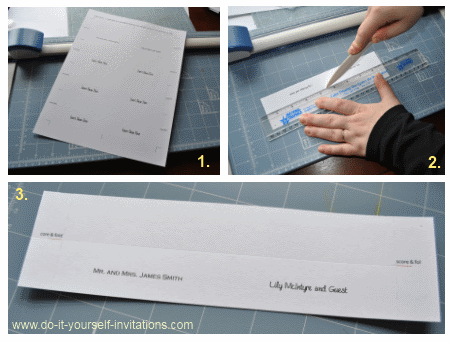 Using your personal paper cutter and our handy cutting guidelines trim the invitation down to 5" by 7" or smaller. The templates are set up to print two invitations per single sheet, so one piece of cardstock will create two wedding invitations. 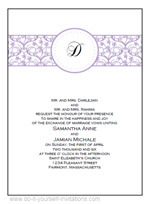 After printing there are several methods in which to personalize and decorate your invitations. You can use rubber stamps, stickers, or rub-ons. You could even go as far as to screen print onto the templates using a Gocco printer or the new Yudu. Add ribbons, rhinestones, glitter, etc. I created the invitation above using our portrait page orientation wedding invitation templates. I changed the names within the wording to a color that coordinated with the wedding color scheme. I printed them onto some heavy paper, trimmed it to 5 by 7, and then decorated them using some self adhesive rhinestones embellishments adorned with colored pearls. I found them in the clearance section at the craft store. I bought every one they had and saved a ton on them! I then mounted the paper into a pocket folder. The bride LOVED these invites! They coordinated perfectly with her chocolate and pink wedding colors. You can easily create a similar kind of effect using a flourish rubber stamp, stickers, or die cuts. This template creates two 5" by 7" invitations. You can make them smaller by simply trimming the paper smaller by the same measurement on every edge for center aligned text, or by trimming the opposite edge from where the text is aligned. The Save The Date cards I created by decorating them with some stickers. One package of stickers were enough to make about 3 STD's and they were pretty inexpensive, so it was pretty cost effective and easy to make. 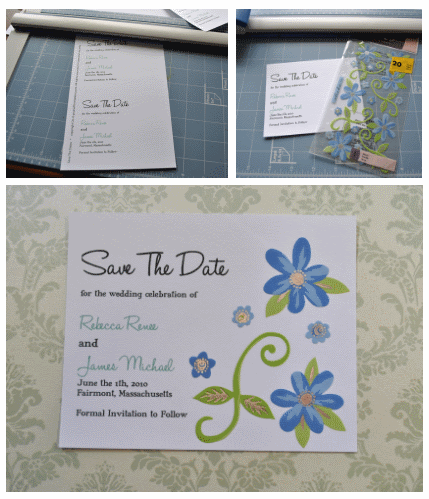 The template creates four 4.5" by 3.75" Save The Date cards. The RSVP cards were created by simply adding a flourish image using a clear stamp, and then adding some color using some markers. Simple yet creative and unique! I love using rubber stamps to make homemade wedding invitations! I used that same stamp throughout most of the other coordinating stationery pieces. This template creates four 4.75 by 3.25 response cards. Use these printable enclosure cards for printing directions to your ceremony and reception destinations, as well as hotel accommodations, wedding websites, and other information. The enclosure cards templates create four 3.25" x 4.75" cards. I created these menu cards by simply layering the printed template with some pattern paper and rounding the corners with a corner punch. I layered the papers by attaching them together using a glue runner. I also added a small rubber stamp strawberry embellishment to this menu. The dessert was the last item on the menu, which happened to be strawberries dipped in chocolate. I just couldn't resist! 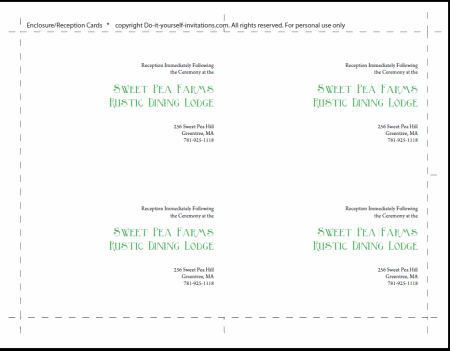 Print this place card template onto 8 1/2" by 11" heavy 110 lb. cardstock and use the cutting guidelines to create eight 3.25" by 1" folded place cards. I recommend using a personal paper cutter and a bone folder to trim and then score the place cards. Trim the cards to 8.5" by 2" by cutting the paper width wise across all of the cutting guidelines. Score them on the scoring guides using a ruler and bone folder. Trim the cards to size and fold in half. You can then decorate them with stickers, rubber stamps, or other embellishments. You can even use them as is with some fancy fonts. 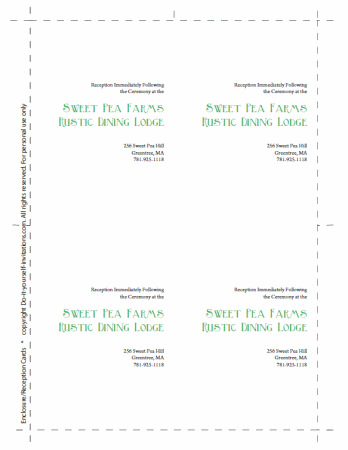 This template creates a full page of 2" by 2" favor tags. As seen above, I have embellished the tags with rubber stamps and decorative paper. You could also try cutting them with some decorative paper edges for a scallop edge, or even use a circular paper punch on them for a circular shaped favor tag. These Favor tags also make perfect monogram stickers for the back of an envelope or to attach to a belly band. The wine labels above were embellished with a simple clear rubber stamp and some yellow stamping ink. I attached the labels to the wine bottles using some double sided tape. The outcome is stunning! Each template create four 4.25" x 3.25" labels. You can print them on cardstock as I did, or even print them onto label paper. Use our handy cutting guidelines to trim them to size and attach to any wine bottle. We also have Water bottle labels! These are for the small skinny water bottles. Browse more free printable wedding invitation templates. Check out our ever growing collection of free printables. We also offer printable invites and kits in our DIY Invitations shop.